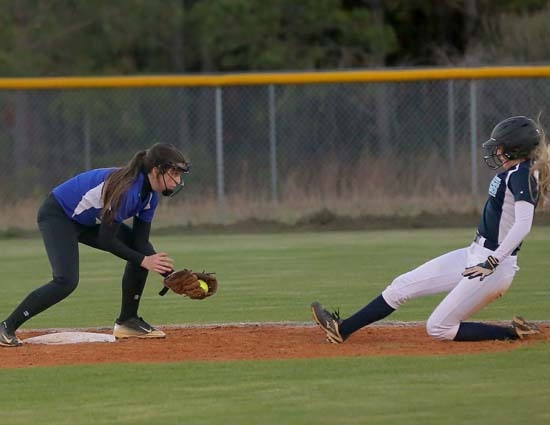 FAYETTEVILE – Sophmore Shelby Pharr pitched a one-hitter and struck out a career-high nine batters Monday to lead West Bladen to a 17-3 non-conference softball victory over Westobver. Pharr walked three and all three runs against her were unearned. Junior Kasee Singletary batted 2-3 with 3 runs scored and 2 runs batted in for the Lady Knights. Freshman Hannah Pait finished 2-3 at the plate with an rbi and 2 runs scored. Sophmore Alyssa Suggs batted 2-3 with 2 runs scored. Senior Conner Brisson finished 2-4 at the plate with a double, 2 rbi’s and 3 runs scored. Pharr batted 2-4 with 3 rbi’s and 2 runs scored. Junior Alara Cashwell and freshman KyLee Ward added one hit each. Cashwell drove in 2 runs, and sophmore Madison Walters and Ward had one rbi each. Ryleigh Bailey scored 2 runs, and Ward, Cashwell, and freshman Lauren Pait scored one run each. Brisson led off the game with a single, stole 2 bases and scored on Cashwell’s sacrifice fly. Singletary walked, stole a base and scored on a passed ball for a 2-0 lead. A walk and an error produced a Westover run in the home first. Pharr laced a single to right-centerfield to begin the Lady Knight second inning, and scored on an error on Walters’ bunt. Westover tied the game in the home second on three errors and a walk. Brisson walked, and Singletary slapped a single to left in the Lady Knight third inning. Cashwell launched another sacrifice fly that scored Brisson with the go-ahead run. After Hannah Pait and Suggs were hit by pitches, Pharr’s fielder’s choice plated Singletary to pad the lead to 5-3. Bailey drew a walk to begin the 8-run West Bladen fourth inning. Brisson reached base on an error, and Singletary laced a single to centerfield that scored Bailey and Brisson. Cashwell swatted a single down the rightfield line that scored Singletary. Hannah Pait yanked a single to left, and Suggs was safe on a bunt single. Pharr’s fielder’s choice plated Cashwell, and Hannah Pait and Suggs sprinted home as Lauren Pait reached base on an error. Bailey was hit by a pitch, and Brisson walloped a double that scored Lauren Pait and Bailey to boost the lead to 13-3. Cashwell was hit by a pitch to start the Lady Knight fifth inning. Hannah Pait ripped a single to left that scored Cashwell. Suggs reached base on a bunt single, and Pharr smashed a single to right that scored Hannah Pait and Suggs. Ward drove in Pharr with a single. West Bladen improved to 7-2 and will travel to rival East Bladen Tuesday night.